Citation: Hanna J. "Psychoactive Stamps: People, Plants, and Postage". Erowid Extracts. June 2012;22:4-5. 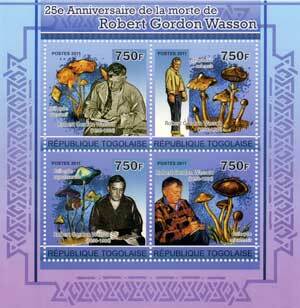 Psychoactive drug historian Michael Horowitz recently brought to Erowid's attention some 2011 postage from the Republic of Togo depicting R. Gordon Wasson. 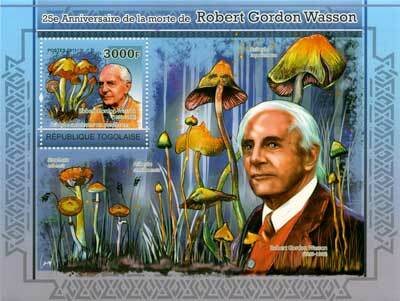 He raised the question: Was this the first time that an entheogenic explorer had been honored on a stamp? The answer depends on who qualifies as an "entheogenic explorer". More than one country has issued postage featuring psychedelic-using musicians such as Jerry Garcia and the Grateful Dead, Jimi Hendrix, the Beatles, and Bob Marley. Entheocognoscenti from the literary world have, to date, only been showcased on "art stamps". Such fake postage has depicted William S. Burroughs, Allen Ginsberg1 and Timothy Leary,2 among others, and a faux stamp of Ken Kesey is the focus of a blotter acid design.3 However, considering only official postage and individuals primarily famous for their psychoactive work, R. Gordon Wasson is the pioneer of postal personalities. Ebert's sarcasm refers to the 2008 Michael Deas portrait of Betty Davis commissioned by the US Postal Service for use on a 42¢ stamp. Though the image is based on a well-known still from her film All About Eve, Davis's ever-present iconic cigarette has vanished from Deas's painting. Her gloved hand remains teasingly poised "in the position", sans smoke. Fourteen years earlier, Robert Johnson, King of the Delta Blues Singers, had the cigarette plucked from his lips by USPS censors in his portrait for a 29¢ stamp. The meager photographic record of this legendary American guitarist makes Johnson's missing smoke feel even more like the hand of Big Brother at work. In contrast, the French government issued a 30-centime stamp honoring Jean Nicot, the man who introduced tobacco to France in 1560, and whose name was lent to both the plant genus (Nicotiana) and its primary psychoactive component (nicotine). Ebert's warning raises an amusing alternate concern: Could psychoactive plants lure a person into the clutches of stamp collecting? It seemed so innocent, yet it could have a tragic effect on one's pocketbook. Alas, I was hooked before I bought my first stamp. With tobacco perhaps out of the picture, what about opium? I needed a fix. Just a couple stamps, even if they were only available in digital form. What could it hurt? Thankfully, I was able to score. Papaver somniferum was first dealt to the USPS by Moina Michael. Inspired in 1918 by John McCrae's poem "In Flanders Field", she conceived of the idea of selling poppies on Memorial Day to raise funds for disabled veterans. Printed in red ink, the opium poppy and Michael's face were offered on a 3¢ US stamp in 1948. (A $1.20 stamp from Australia continued this theme in 2011, featuring red poppies, text from McCrae's poem, and the silhouette of two soldiers.) The second stateside poppy postage was a 32¢ stamp issued in 1996 with a Georgia O'Keeffe flower on it. "My name is Jon, and I'm a pharmacophilatelist." From online ogling to casual collecting, opium art was the gateway. 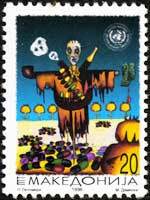 With its beautiful black poppy pod overlaid with a human skull, a stamp issued by the United Nations and flanked by the slogan "Stop Drug Abuse" opened up the world of prohibitionist postage. There was an 8¢ "Prevent Drug Abuse" stamp (1971) and an 18¢ "Alcoholism: You can beat it!" stamp (1981), both from the USPS. Additional anti-drug stamps came from Brazil and Italy, with the star of the bunch hailing from Macedonia: a scarecrow made of pipes lashed to syringes. Flanked by poppy pods and wearing a capsule-filled bandolier, ghostly skull-shaped smoke clouds issue from one of his pipes, as the needle of his hypodermic hand pierces money dripping with blood. Additional pills lay scattered at his feet. While other countries produce anti-drug stamps, the search for postage that did not portray psychoactive plants in a negative light was more compelling. As it turns out, there are more than one might expect. A nightshade, a showy passionflower, and a Peruvian tobacco stamp that I happily purchased were followed by another featuring a tobacco pouch. Then came a stamp from Dominica celebrating the introduction of coffee, three from the Republic of Togo focused on Theobroma cacao (chocolate), a couple of beautiful peyote stamps (one from Russia, one from Vietnam), and even a Gymnopilus spectabilis stamp from Cambodia. As it turns out, mushrooms are the mother lode for drug-stamp geeks; I harvested four Amanita pantherina and nine A. muscaria. If Wasson, Why Not Hofmann? Uncancelled "mint" stamps that end up in private collections are nearly pure profit for the issuing country, which gets the money without having to deliver any mail. Since no obvious connection exists between Togo and R. Gordon Wasson, it's possible that their decision to honor his mushroomic work stemmed in part from this monetary perspective. This sparked an idea: Along with their chocolate, cheese, watches, and knives, the Swiss are renowned for their savvy financial dealings. And really, who could be more deserving of having his image on a stamp than the man whose contributions so profoundly impacted the studies of neurochemistry, psychology, and spirituality, Switzerland's national treasure (and Wasson's colleague), Dr. Albert Hofmann. In the spring of 1843, one hundred years before Hofmann's infamous bicycle ride--and following the United Kingdom's lead--Switzerland became the second country in the world to produce postage stamps. Diverting some stamps from my stash, I sent an old-fashioned letter to the Swiss Post, suggesting that they appropriately honor the good doctor by placing his picture on a stamp. In the arena of postal history, the Swiss have the chance to come in second again! And seeing Hofmann's mug featured on small, perforated pieces of paper feels like an entirely appropriate tribute. 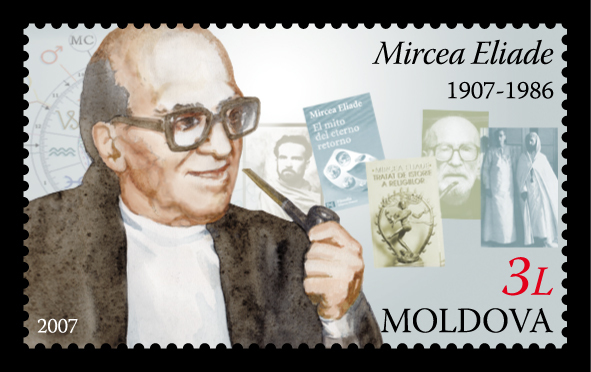 Although his life's work was not primarily focused on entheogenic plants and/or drugs, it has come to my attention that religious historian and author of the scholarly book Shamanism: Archaic Techniques of Ecstasy, Mircea Eliade was featured on a 3 lei stamp from Moldova in 2007.